Steven Attree Hopkins, a longtime resident and well-known cobbler, peacefully passed away Saturday, August 19, 2017, at the home of his brother, surrounded by family and friends. Born in Passaic, New Jersey, on June 2, 1950, he was the son of the late Cyril James and Joan (Thoms) Hopkins. Steve was 67 years old. Steven graduated in 1969 from Mahwah High School in Mahwah, New Jersey, and continued his education at Northeast Missouri State University. He opened and operated the Leather Noel in Montvale, New Jersey, for 10 years, before moving to St. Albans, Vermont. For a short time, he operated the Hopkins & Johnson Leather with Arden Johnson in St. Albans. Steven later opened the Onion River Cobbler shop in Winooski for the past 32 years. As an avid outdoorsman, he enjoyed hunting and fishing outings with family and friends in Vermont, Maine, and New Brunswick, Canada. 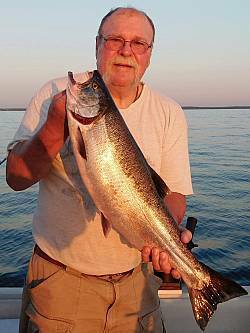 He was a past president of the Vermont Bowmen’s Association and also was a Vermont state champion for archery; was on the board of directors of the Franklin County Sportsman Club; and was a longtime member and board member of the Lake Champlain Walleye Association. Steven enjoyed taking long rides on his Harley, being at his family’s camp on Butler Island, and watching/photographing “just another sunset” from his home on Lake Champlain. Survivors include his brother, Fred Hopkins, and his wife, Maureen Lake Hopkins, of St. Albans; a cousin, Larry Wilberton and his wife, Linda, of Wolfeboro Falls, New Hampshire; very close family friends: Willard and Nancy Rowell of Highgate, and their daughter, Liz; and Clarence and Stephanie Walton of Ashland, New Brunswick, and their sons, Charlie, Zachery, and Shane. In addition to Steven’s parents, he was predeceased by his two canine companions, Sandy and Blockhead (“Blocky”). A celebration to memorialize his life will be held at a later date. In lieu of flowers, memorial contributions may be made to the Lake Champlain Walleye Association, P.O. Box 104, Swanton, Vermont 05488. To send Steven’s family a written expression of sympathy or share a memory, please go to his on-line guest book at www.healdfuneralhome.com.